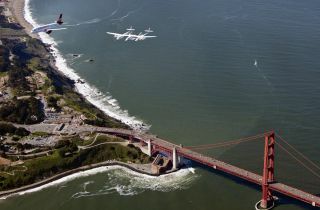 Virgin Galactic's private SpaceShipTwo spacecraft and its mothership WhiteKnightTwo flies over the Golden Gate Bridge with the Virgin America plane "My Other Ride is a Spaceship" on April 6, 2011 en route to open Terminal 2 at San Francisco International Airport. Fifty years after Russian cosmonaut Yuri Gagarin became the first human to experience the wonders of spaceflight, commercial companies appear to be on the cusp of a breakthrough industry -- space tourism. In a bid to open up the final frontier to an expanding group of people, private firms are racing to provide paying customers with unique orbital and suborbital experiences. Suborbital spaceships would take passengers up to space at an altitude of about 62 miles (100 kilometers) -- commonly known as the edge of space -- before returning to Earth. These passengers would get a glimpse of the edge of our planet and the blackness of space while experiencing several minutes of weightlessness. The Stern family of Colorado float in weightlessness during a Fourth of July holiday flight aboard a Zero Gravity Corporation aircraft on July 4, 2010. Since the company's first flight in 2004, Zero G Corp. has flown over 6,000 people, including former Apollo astronaut Buzz Aldrin, and celebrities such as Martha Stewart, rocker Ozzy Osbourne and famed astrophysicist Stephen Hawking. Founded by British billionaire Sir Richard Branson, Virgin Galactic has been making waves in the suborbital spaceflight industry. Virgin Galactic's SpaceShipTwo space plane is designed to be carried into midair by the company's massive WhiteKnightTwo mothership. At an altitude of about 50,000 feet (15,200 meters), the carrier plane releases SpaceShipTwo, which fires its rocket engine and climbs toward the edge of the atmosphere. Passengers will experience roughly five minutes of weightlessness before gliding back for landing. Other companies looking to break into the suborbital spaceflight market include XCOR Aerospace, Blue Origin and Armadillo Aerospace. The highly secretive Blue Origin, which is founded by Amazon.com CEO Jeff Bezos, is developing a fully reusable suborbital vehicle called New Shepard, which is capable of flying three or more passengers on suborbital flights. Armadillo Aerospace, a Texas-based company founded by computer game entrepreneur John Carmack, is working on a vertically launched rocket ship to carry passengers to the edge of space. Armadillo Aerospace's deal with Space Adventures will offer these suborbital flights for $102,000 per passenger -- almost half the going rate for a seat on one of Virgin Galactic's joyrides. An artist's rendition of XCOR Aerospace's Lynx space plane high above the Earth. Roughly the size of a small private airplane, the craft is designed to make several flights a day into a zero-gravity environment. Space tourists, including scientists and researchers, are required to undergo some sort of training prior to their suborbital flights, and one company, the National Aerospace Training and Research Center (NASTAR) in Southampton, Pa., is hoping to capitalize on what could one day be a booming market. The $3,000 NASTAR training program is designed to familiarize passengers with the rigors of spaceflight. The training runs, which include rides in a centrifuge that can pack on forces up to six times the normal force of gravity, can simulate the flight profiles of various vehicles, making the courses adaptable to the specifications of different companies. The Virginia-based Space Adventures is a space tourism company that arranges multimillion-dollar trips to the International Space Station for extremely wealthy clients. The firm is the only company that has booked private flights to the space station, and brokered those deals with the Russian Federal Space Agency, to charge customers about $35 million for rides on Russian-built Soyuz spacecraft. Dennis Tito, a California-based multimillionaire, became the first-ever space tourist when he launched to the station in a Soyuz capsule in 2001. A string of wealthy individuals followed, including American billionaire Charles Simonyi and Ansari X Prize backer Anousheh Ansari – the first female space tourist. In total, Space Adventures has arranged eight private space tourist flights to the International Space Station for seven people (one customer flew twice) since 2001. The most recent flight occurred in October 2009, which sent Canadian billionaire Guy Laliberte, founder of the circus troupe Cirque du Soleil, on an 11-day space excursion. Space Adventures recently announced that it will resume these high-profile spaceflights in 2013. A new agreement with Russia's Federal Space Agency (Roscosmos) and the country's spacecraft manufacturer, RSC Energia, earmarks three Soyuz seats per year for Space Adventures beginning in 2013. Tickets for these flights are already available for purchase. Several companies are hard at work designing, building and testing vehicles that aim to fill the American gap in human spaceflight following the retirement of NASA's space shuttle program. These commercial providers hope to carry astronauts to the International Space Station, but could also one day transport other paying customers to the space station and future destinations in low-Earth orbit. Boeing, SpaceX, Blue Origin and Sierra Nevada are developing and testing vehicles and launch systems as part of NASA's Commercial Crew Development (CCDev) program. Boeing's Commercial Space Transportation-100 (CST-100) space capsule is being designed to carry astronauts and supplies to the space station, but the aerospace giant has also partnered with Space Adventures to sell passenger seats for future CST-100 flights. These trips would bring customers to the International Space Station, and perhaps one day to Bigelow Aerospace's planned inflatable space station. At least two other efforts to build commercial space stations for private orbital spaceflights: The Isle of Man-based Excalibur Almaz is currently working to build new stations based on proven Soviet-era designs while the Russian team of companies RSC Energia and Orbital Technologies hopes to launch what it bills as the "world's first commercial space station" by 2016. SpaceX's Dragon capsule will soon be used to ferry cargo and supplies to the International Space Station, but the Hawthorne, Calif.-based company is also working on a version of the Dragon that can carry humans into orbit. Sierra Nevada, based in Sparks, Nev., is developing a seven-person Dream Chaser vehicle for private spaceflight. The spacecraft is being designed to launch vertically on a rocket and land horizontally on conventional runways. Orbital Sciences of Dulles, Va., already has a contract with NASA for its Cygnus freighter to carry supplies to the International Space Station. The veteran aerospace company also proposed a crew-carrying vehicle -- a winged space plane called Prometheus -- that could carry four to six astronauts into low-Earth orbit. The proposal was not chosen for funding under the second round of NASA's CCDev program, so the spacecraft remains a concept at the moment. Other contenders for orbital space tourism include Chicago-based PlanetSpace, Inc., which is designing a space plane called the Silver Dart; Blue Origin and its planned orbital space vehicle; and Excalibur Almaz Limited, based in the Isle of Man, which is retrofitting old Soviet spaceships for future commercial flights.